This is a question we get asked lots at our dental practice here in Watford, so we thought we would take some time to take a look at the common reasons why your teeth may not be quite as white as you’d like to be… Some of those reasons are obvious but others aren’t! It sounds quite obvious but there are many foods which have any impact on the colour of your teeth. Some foods that stain your teeth directly whilst others contribute to dental decay by being rich in sugar. Some food on the other hand has naturally dark staining such as dark berries, tea and red wine. These may stain your teeth on their own but the staining is compound it if you have plaque on your teeth caused by a combination of poor oral hygiene and sugar in the diet. Even if your diet isn’t too rich in sugar and you avoid the food with strong colours then your teeth could still be yellow then you would like if your oral health care routine isn’t as good as it should be. Yes, it’s possible to clean your teeth too much! If you scrub your teeth too much then the gum can recede as it will often become irritated due to the excessive brushing. As the gum recedes it may expose the softer dentine part of your tooth which is lower down towards the root. This part of the tooth is softer than the enamel (apart which you usually see) and is therefore more susceptible to both dental decay and staining.. When you brush, go easy and don’t scrub, if you visit a dental hygienist regularly they will be able to tell you if it looks as though you may be pressing too hard when you clean your teeth. It may also be worth considering an electric toothbrush, many of these have pressure sensors and light up red if you are pressing too hard, really useful aid if you find this is a problem for you. The first thing to say is that you should never stop taking any medication that has been prescribed to you without first consulting your doctor. It has however been reported that some medications may affect the colour of your teeth, most often this happens if the medication is taken during childhood whilst the teeth forming, rather than extrinsic staining of the teeth at a later date in adulthood. 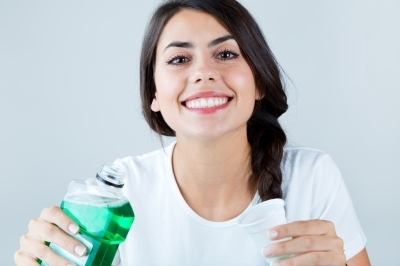 Some medicated mouthwashes can also stained teeth, so please ensure that you read the label of any medicated mouthwash that you may have been prescribed. Rest assured though, if your teeth have been stained through using a medicated mouthwash this can easily be removed by your dentist. Well, you knew this would probably come up at some point! Smoking darkens teeth because it changes the delicate PH balance in your mouth, it also dries your mouth out which leads to an excessive buildup of bacteria. This bacteria not only have a rather noticeable smell, but also can contribute to increased rates of dental decay. The smoke itself also has many this colouring components which, particularly when coupled with poor oral hygiene, can stain the teeth quite noticeably. This is often more prominent on the lower teeth towards the biting in size or age, it can be noticed that there is significant yellowing or staining right on that chip area, this is known as secondary dentine and is a common concern with people in, shall we say, more senior years! The good news is that most of these problems can be quickly and simply resolved. If you give up smoking, look at your diet and ensure your oral health care routine follows the suggested procedure then you can have a big impact on the colour of your teeth. Your dentist can also whiten the teeth in a couple of ways. If your teeth just have surface staining perhaps from smoking or food stains then this can be removed with an air abrasion technique, this blasts very small particles at the end at your teeth which very gently remove the surface stain. If however the enamel of your tooth is intrinsically not as white as you would like them teeth whitening could also be the perfect option for you. What ever you decide, your friendly dentist in Watford, Senova Dental Studios is here to help, please contact us today to book your appointment and begin your journey to brighter, whiter teeth.